Learn to enhance your assessment and teaching of phonemic awareness! Finally teachers have access to a professional development series, Evidence-Based Instruction in Reading, written specifically to guide them in sharpening their understanding of the five key components to Reading First-phonemic awareness, phonics, vocabulary, fluency, and comprehension. This book focuses on phonemic awareness, but each volume in the five-part series addresses one key component and presents friendly tips and strategies that teachers can take right into the classroom. How to make Phonemic Awareness work for you! Consider recommendations for incorporating appropriate reading materials, fostering productive home-school connections, and promoting students' desire to learn to read and write. Read about the findings of current key research studies and learn about their implications for classroom practice. Discover how to evaluate your current practices and create concrete plans for change. Start a learning community or book club and share your knowledge with colleagues. Access useful resources and links to extend and enrich your own learning beyond the classroom. 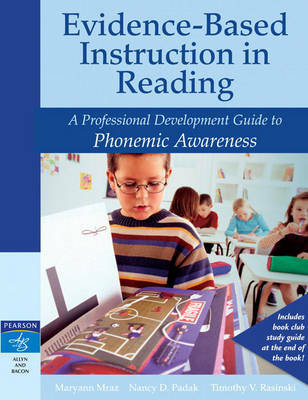 Teachers rave about A Professional Development Guide to Phonemic Awareness! "I have been in reading instruction for 33 years and there are teachers in my school who have been in for three years [to] 23 years...with the variation in experience, we have a wide variety of backgrounds...this text brings all that together because of the way it is written...I would use [this book] with my lower grade Reading First teachers and with teachers in grades 2 and 3 for struggling readers. Phonemic Awareness is usually a missing piece in those students who are not on grade level by this time. We could put this information to good use and make it applicable at many grade levels."